Honestly, if you'd told me as a kid that I'd be able to put "Local" and "New Zealand" in the same sentence, I'd have given you a pretty impressive blank stare before bursting out in a fit of laughter. Nonetheless, here we are. In case you're new here, My name is Kat, and as of the date of this post I've been living in Auckland, New Zealand, for a few months shy of three years. If you're thinking about visiting, first of all I wholly support that plan, because New Zealand is awesome, so is Auckland, and you'll never want to leave. Second of all, leave some extra room in your suitcase and set yourself a fabric allowance because you're about to be spoiled for fabric shopping choice. Auckland's got a great selection of garment fabric shopping options, which I'm fairly confident is related to the three universities in the city that offer pretty sought-after degrees in fashion design. I don't really have a desire to be a fashion designer, but I'll ride that wave if it means awesome fabric choices! I've been meaning to write up a post on all the fabric shopping options in this city for a while (I'm from southern Illinois originally, so the options have not always been so numerous for little old me) but it's in the here and now because Alex from Sewrendipity is working on putting together a really awesome database of local fabric shopping guides called 'Fabric Shopping On Tour' for locals to give the lowdown to traveling sewists, and I volunteered as tribute for Auckland. If you see something you like, click on the "View larger map" link in the embedded maps, and it'll take you to the google maps page with directions, hours, and pertinent info about the businesses. Intro: Asia Gallery is an independently owned Asian imports shop, so there's more than just fabric available. It's located in Penrose, easily accessible by car or bus, and an 11 minute walk from the nearest train stop. They don't have a website and you're not allowed to take photos in the shop, but you can check out their shop Facebook page for more photos and info. Go for the $20 Kimono rack - a huge selection of silk, wool, and cotton kimonos in every imaginable color - they're preloved but the fabric you can harvest from them is enough for a lot of different types of projects! Ease of access: Good via car, ok via bus. It's a bit of a walk from the train stop. Parking: Three spaces out front, plus a lot of street parking. Fabric Selection: traditional Japanese (narrow) yardage, scraps, silk scarves, Kimono, habotai and indigo pieces. Majority natural fibers. Cost: Inexpensive to moderate. Independently owned. I have one silk and one wool kimono that I have plans to refashion, and my sister picked one out as well for me to make into a boxy tank top and a pair of shorts. It's an opportunity to give new life to old, pre-loved garments, to wear a bit of history, and to have fun with a refashion as well! Intro: Bolt of Cloth is a Marimekko store in Newmarket - they sell fabric, but also lampshades, throw pillows, pre-made curtains, and homewares with the designs printed on them. The fabrics definitely lean towards the homeware sewist - thick cottons, etc. - but there are some great Marimekko prints on linens, linen blends, and some lighter weight cottons that would work for clothing, as well as some other brands to choose from. Ease of access: Average via car, great via bus and train. Parking: There's no dedicated parking, but there are options nearby. Size: Small, and the fabric selection is only about half of what's available. Fabric Selection: Mostly quilting cottons and heavier canvas, curtain, and home fabrics. I do like those quilting cottons for linings though! I used fabric from Bolt of Cloth to line a canvas backpack which I haven't yet blogged about, but I promise it's coming soon! Intro: Centrepoint is one of the better-known and largest fabric shops in the Newmarket area, and they've got a pretty broad selection of brightly colored dressmaking fabrics, rayons, special occasion fabrics (the biggest bridal fabric selection I've found locally) along with old standards like merino, denim, flannel, etc. I personally haven't found love in any of their fabrics, but it's not for lack of choice. Things are just a bit...brighter... than my usual. They've got a wedding dress fabric section complete with large mirrors, couches, its own cutting table, and a designated employee to hang out in that section and answer questions. Ease of access: Okay via car (two designated spots plus street parking) a bit of a walk from the train, and good on the bus. Parking: Yes, but it's limited. Size: Very big, with good variety if you're looking for fancy fabric. Fabric Selection: Dressmaking and home decor fabric, bridal, laces, emphasis on color and design over fabric content for fashion fabrics, but also a solid selection of basics. There's also a well stocked haberdashery section. Cost: Moderate to expensive. Independently owned. Intro: Full disclosure, Draper's Fabrics is my favorite, and most frequented fabric shop. Although it's on the smaller side, I never find myself digging though fabrics I dislike to find hidden treasure - instead, all the treasure is laid out for perusal. The shop is well curated and not overwhelming, with an emphasis on natural fibers and apparel fabrics. Also: best denims this side of the equator, in my not at all humble opinion. Ease of access: Great via car, bus, or train. Parking: Yes, the parking lot is across the street in an empty lot, but there are always spots available! Size: on the smaller side, but well curated. Fabric Selection: Dressmaking fabrics like rayon and silk, some leather, denim, shirtings, vintage wool suitings, coating, some hard to find activewear and swim options, and limited haberdashery to include buttons, zippers, and thread. My Ginger Jeans are all made with fabric from Draper's Fabrics, as are this skirt, that dress, and these culottes to name a few. 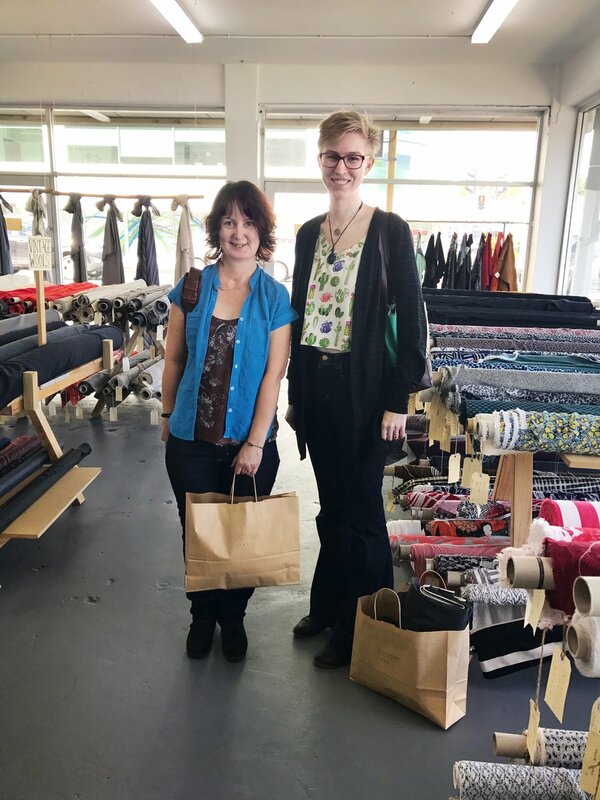 I met Instagram Friend and owner of Elle Joan's Lingerie Supplies, Lynda, in real life in Draper's Fabrics for a morning of shopping - so it kind of holds a special place in my heart! I'm wearing my Gingers with Draper's denim (the denim poking out of my bag is now a pair of Gingers too! ), and Lynda's floral shirt is made from their fabric as well! Intro: This place was a revelation to find. It's one of those hole-in-the-wall, dark, questionable looking warehouses but as soon as you walk in you're greeted with a huge explosion of every kind of fabric imaginable, literally stacked from the floor to the ceiling. It can be overwhelming and if you decide you want to look at it all you'd be there all day. It's full of factory ends and random container shipments, nothing curated but all at a fabulous price range, if you trust yourself to pick the quality from the questionable. Also, the staff is insanely friendly and accommodating. Ease of access: Great via car, and you could do a bus if you had to. No trains. Parking: Yes. The parking lot seems big, but it fills up fast. There's street parking in the area as well, though. Size: Very big, and jam packed with fabrics on shelves all the way up to the ceiling. Cost: Very inexpensive. Independently owned. I've made this sweater, my favorite circle skirt (for under $15! ), a few unblogged basics, and a swim cover up with their fabric. I also use their elastics and laces in a lot of my bras. They tend to close the shop for the entire month of January for a Christmas holiday, so check the Facebook page for dates if you're here around that time. Intro: The Fabric store was actually my first introduction to the concept of a 'curated' fabric store, and seeing as it's four blocks from my house I'm there pretty frequently. It's an expensive place to shop, and the sales are few and far between but when they do have a sale on, it's really on. Parking: There's a parking lot with six spaces. That's generally fine except at peak hours, when you may need to park on the street. Size: Huge, considering real estate in that part of town, but not the biggest fabric store in Auckland. Fabric Selection: The Fabric Store's bread and butter is fabric that's been overproduced for designer runs. You'll find labels like Michael Kohrs, DKNY, and italian brands too, along with a beautiful selection of New Zealand merinos that they're famous for. They tend to stick to natural fibers, but there are a few synthetics in the mix as well - almost all are apparel fabrics. They have a button and zipper selection behind the counter, and the remnant bins are positively not to be missed. They have a good range of leathers as well. I've made this shirt, and this one, with fabric from The Fabric Store. Also their silks went into this bra and that one. Jon's linen shirt came from there, and my feather dress as well. Intro: Although this is probably the closest fabric store to my house (a three or four minute walk tops), I don't really go that often. There's a hefty selection of crisp cotton shirtings, dress pant fabric, and special occasion fabrics, and I tend not to make things out of those types of fabrics. They do have a good coating selection, and a few gems to be found, but it's not part of my regular rounds. Parking: Yes, plenty. The parking lot is obscenely large and always empty. Size: Pretty small, but packed to the ceiling with stacks and rolls of fabric. Fabric Selection: Apparel fabrics, some special occasion fabrics, mostly woven over knit. A small corner of haberdashery items and some non-stretch lace and dance fabric. Cost: More expensive than you'd think, but the quality is there. Intro: Love. Geoff's. It's right across the parking lot from my local grocery store (plenty o' parking) and the only thing more colorful than the fabric selection is the staff. It's a true emporium - with a little bit of everything in stock. They're not all the highest of quality, but if you hunt through the racks you'll find cotton shirting, rayon prints, upholstery and special occasion fabrics, and some great knits as well. I buy my testing fabric for muslins here for about $3/m and I'm always finding new things. They've also got a good haberdashery assortment and a good button selection - not to mention other random art supplies which come in handy frequently. Ease of access: Great via car or bus. I wouldn't walk from the train stop though. Size: medium to large, and very packed. You'll have to squeeze past other people in the aisles. Fabric Selection: Apparel fabrics and home fabrics, mostly unlabelled so shop with caution if you're polyester-averse, but there are treasures buried there! Cost: So inexpensive! Independently owned, but it has a 'brother' shop on the north shore called Ike's Emporium which I have yet to visit. Aside from all my muslins and a lot of my buttons, The fabric for Jon's Bula Shirt came from Geoff's, as did my reusable shopping bag ripstop. Intro: Hawes and Freer is a bit of a special case amongst Auckland's fabric shops. They're not open on weekends or holidays so even though it's very close to my house I've only actually been in to the building once on a fluke of a non-working Wednesday. It's not really a shop, so much as a warehouse connected to a set of offices. When you walk in, there's a front counter with a little bell, some couches, and a waiting area with swatch racks. That opens up into a warehouse with a front counter. You tell someone what you're looking for and then choose from swatches they bring you to look at, and either your fabric is cut for you there (I think, maybe, in a man-behind-the-curtain sort of way) or you order it and they send it out to you (that's what I did). It seems very geared toward the small-scale manufacturer rather than the home sewist, but they were happy to work with my small, home-sewist quantities as well so I'm not sure. Ease of access: Great if you're driving - and there's a bus stop at the end of the road. Parking: Yes, street parking.. I wouldn't risk the weird tiny parking lot. Size: I think pretty big? Checking out the website gives a better idea of what's available. Fabric Selection: High End lining, shirting, and silks - solid dress fabrics, interfacing, and bridal supplies. Plus, a button dyeing service if you're into that sort of thing. Cost: Moderate to high, but reasonable considering. Independently owned. I use Hawes and Freer for interfacings, and have purchased their invisible tulle for my wedding dress as well as some bemberg lining which I used in my vintage coat. Intro: I've only been to Nick's a handful of times - not that I dislike it, just that they generally don't have the types of things I'm looking for. That said, My boss was my secret santa at work this year, and he went to Nick's, told them he was shopping for a gift for a girl who is always cold and likes to sew and that he had $13.50 to spend (that was our secret santa limit, I know it's a weird number) - and the guy sold him two meters of the most beautiful merino interlock for that $13.50. That type of fabric is generally around $40/m, so there are definitely gems to be had at Nick's. Ease of access: Fine if you've got a car, you could risk it on the bus, don't take the train unless you're desperate. Size: Very big - this place is a warehouse. The kind with a loading dock next to the entry, and with high ceilings stacked to the top with rolls and rolls of fabric. Fabric Selection: Upholstery fabric, apparel fabrics - a wide and not overly curated selection that contains a bit of everything. There are a few gems hidden amongst the polyesters, including merinos, silks, and some very nice cotton flannels. Intro: I initially discovered the Ribbon Rose as a yarn shop, but they carry supplies for lots of other things as well. Embroidery floss, thread, tools for quilting, sewing, knitting, weaving, felting, beading - you name it. They're light on apparel fabrics, but heavy on tools you might need to sew apparel, as well as supplies for pretty much any other textile-based hobby. They also host a knit night and quilting classes, though I've never been. Ease of access: Great with a car, could do it with a bus. The walk from the train stop is a bit long. Size: Big, for what it is. Fabric Selection: There is a good selection of quilting fabrics, yarn and yarn supplies, scrapbooking stuff, and most importantly - the biggest collection of embroidery flosses and threads I have ever seen. Seriously, if you need unusual thread, they'll have it. I also generally pick up fat quarters of quilting cotton when I'm here to use for pockets. The pockets for these jeans came from fat quarters I purchased at the Ribbon Rose. Also, embroidery thread for this cardigan. Intro: If you live in the US, the easiest explanation of Spotlight is that it's like a Joann Fabrics. It's your standard, big box chain type fabric store that has 'departments' for bedding, homewares, acrylic painting and crafts, scrapbooking, and then that scary corner in the back with the mountains of acrylic yarn falling out of bins like a furry, multicolored waterfall. I try to avoid the place, but they do have the big thread rack and the good notions section with the spare machine lightbulbs. Also, although it's expensive, the fabric is good quality most of the time. Ease of access: Great with a car, could do it with a bus. There's a train stop in the mall across the street so that's an option as well. Size: Big, but more than just fabric. Fabric Selection: You know how patterns say they're for an 'adventurous beginner'? - the fabric here is geared towards the same kind of person. Everything's clearly marked and there are floral rayons, solid wool suitings, nice cottons and knits - but it's more basics than beautiful pieces that set your heart aflutter, y'know? Sometimes you just want solid cotton jersey, though, and this is the place to get it. They also have quilt stuff, the standard tool selection, interfacings and linings. Cost: I always think everything there costs more than it should. Look for coupons! The succulent shirt was spotlight fabric. I also used them for the gingham and insulated lining in my picnic basket. Elle Joan's Lingerie - an Etsy shop with a great selection of lingerie sewing supplies like fabric, elastic, and findings. Lynda is at least partially responsible for my bramaking obsession, so go check her out! Miss Maude's - a delicious and carefully curated online shop full of fabric, notions, and supplies. I get my jeans supplies and Merchant & Mills swag from Emma, and she always sends little thank-you notes with a swatch stapled to it so that you can pet some potential future fabric. GDL Trading - hardware, rivets, snaps, and lots of other things you might need to complete a project. They do actually have a location south of Auckland, but I order off the website. You can order individual snaps, yo! Elizabeth Jayne Bridal - run out of the front room of a lovely woman on the north shore - she's got a selection of bridal fabrics and laces and a big mirror for you to drape yourself in all things wedding-y. Open by appointment only. Fabric Drop - an online fabric shop run by two sisters between New Zealand and Australia - They have a curated selection of garment fabrics and offer awesome descriptions, pattern suggestions, and lots of pictures to make the ordering process easier! Lapco - supposed to be the biggest source of leather and leather tools in New Zealand. I'm ashamed to say that this place is literally an eight minute walk from my house and I haven't been in to visit yet. I'll get there. Also, if you are in Auckland and I missed a shop, holler in the comments and I'll add it to my list!